In a related LibreOffice story, Mark Shuttleworth has apparently announced the switch, although so far all instances of this story originate with Techdrivein. 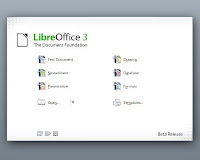 Canonical founder Mark Shuttleworth announced that, future releases of Ubuntu will be shipped with the new OpenOffice fork. He said, "Office productivity software is a critical component of the free software desktop, and the Ubuntu Project will be pleased to ship LibreOffice from The Document Foundation in future releases of Ubuntu."